Topic: Thoughts on Necron paint scheme and army lists? Thoughts on Necron paint scheme and army lists? Hello to any and all. Recently I bought a decent necron army from my friend, worth at least 2000 points which I will list below. Models are largely complete, with a bit of work still to be done. I have included pictures, and would like to know what you think of the current paint scheme, and if you have any suggestions on where to go next. This friend of mine painted using a lot of Mithril Silver, whereas I prefer to use Boltgun Metal, what do you think looks better on necrons? I'm thinking of trying a sort of blue, bleach bone, black look on the second monolith but not sure about how that would fit with the greed rods/crystal, so any tips or ideas? From here, I was thinking of buying 2 Arks, 2 Scythes, 2-5 Crypteks, Illuminor Szeras and/or Imotekh the Stormlord, but money is limited. Yes or No? Anything else I should consider? Re: Thoughts on Necron paint scheme and army lists? Nice looking stuff. If Moc is around, he'd probably appreciate the problems inherent with red paint! Personally I work with Boltgun because it is a 'medium' base to work from. You can darken it with a wash, and conversely you can highlight with Mithral. Mitheral can be touchy with finishing sprays too. I've seen it almost turn 'white' when reacting to certain finishes. Good luck with your army... those Arks are such a pain to get put together. Black and green obviously go together! On a related note, I've been painting up a Necron army for a friend and I found glow in the dark green paint at Walmart. I've been adding it to the "glowing" parts of the stuff that has POS lighting. I just glob it on, it dries a semitransparent apple green (so it's barely noticeable until you turn off the lights! 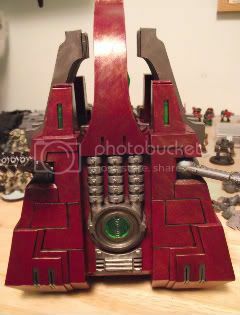 I'd be interested to see some other necrons in red, if there are any good pictures floating around. Any more replies would be welcome!